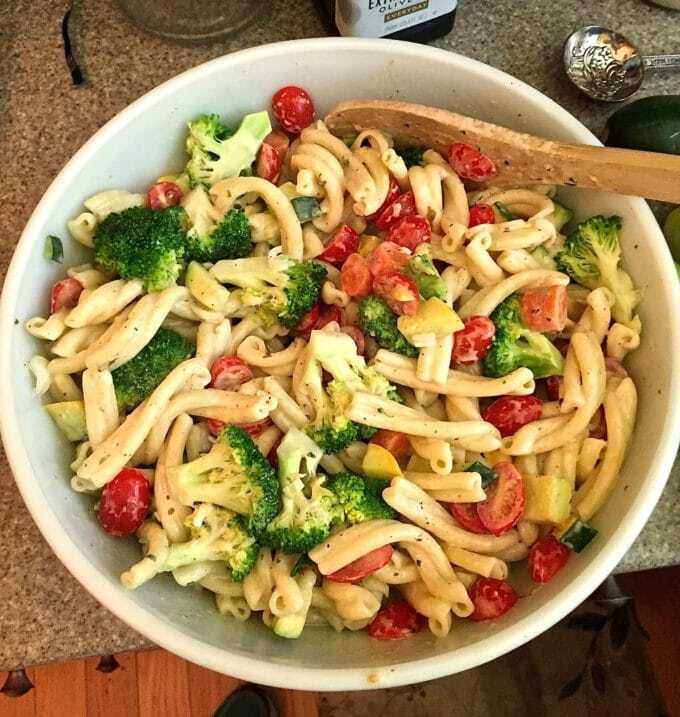 Summer Garden Pasta Salad is a delicious, healthy, veggie-filled salad that is loaded with summer squash, zucchini, carrots, scallions, edamame, broccoli, and cherry tomatoes! For most parts of the country, Labor Day, which pays tribute to the achievements of American workers, signals the end of summer and white shoes. The explosion of fresh fruits and vegetables which we have enjoyed all summer will begin to taper off at farmers’ markets, school starts back for both big and little kids, the promise of cooler weather is in the air, and leaves are starting to turn. It’s also beginning to get dark a little earlier each evening; pretty soon pumpkin everything recipes will be flooding the internet and the Thanksgiving and Christmas holidays aren’t far behind. Today I have the perfect menu to help you savor these last few days of summer and send it out in style. So fire up the grill and let’s celebrate Labor Day with an out of this world Grilled Chicken with Peach Glaze, Summer Garden Pasta Salad and, for a fabulous end-of-summer dessert, wait for it… Strawberry Margarita Ice Pops! Yes, you read that right, Strawberry Margarita Ice Pops! I can’t even begin to tell you how good they are! Summer Garden Pasta Salad is a healthy, veggie-filled pasta salad which will be a perfect addition to your Labor Day festivities. This Summer Garden Pasta Salad is not the usual pasta salad that shows up at most potlucks or picnics. This lighter, healthier version is loaded with all things good for you, including summer squash, zucchini, carrots, edamame, scallions, broccoli, and cherry or grape tomatoes and it’s delicious! You could add even more vegetables or substitute different ones if you choose and you can also substitute any other type of pasta you have on hand or your family likes. This recipe calls for feta cheese, but again, you can also substitute any other type of cheese (think goat cheese, blue cheese or mozzarella) that you have on hand, or your family prefers. 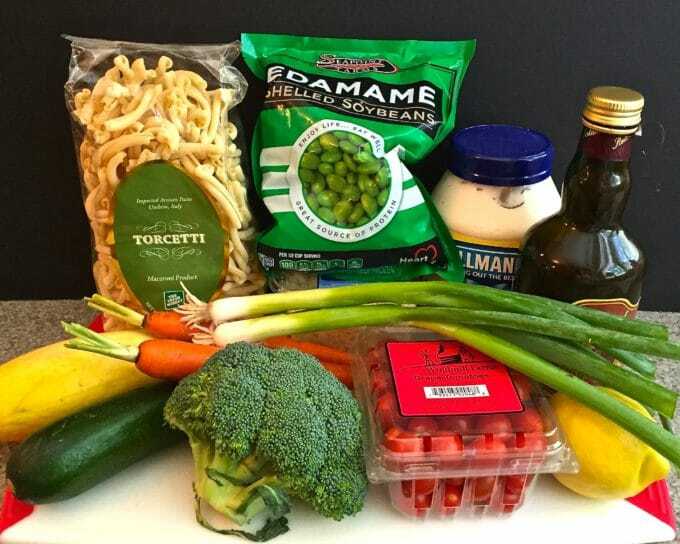 The complete list of ingredients includes pasta, kosher salt, summer squash, zucchini, edamame, carrots, scallions, broccoli, cherry or grape tomatoes, olive oil, garlic, red wine vinegar, lemon juice, mayonnaise, (just a little, I promise) sugar, black pepper, and feta cheese. To get started, add the pasta to a large pot of boiling salted water. Check the directions on the pasta package and set a timer for 3 minutes less than is shown to cook the pasta. For instance, if the directions say to cook for 10 minutes, set your timer for 7 minutes. When the timer goes off, add the carrots to the pasta and cook for 2 minutes longer. When there is 1 minute remaining, add the broccoli, squash, zucchini, and edamame and continue boiling for 30-45 seconds to blanch the veggies or until the broccoli is bright green. Immediately drain the pasta and your veggies in a colander and run cold water over it to stop the cooking process. Make sure to drain it thoroughly. 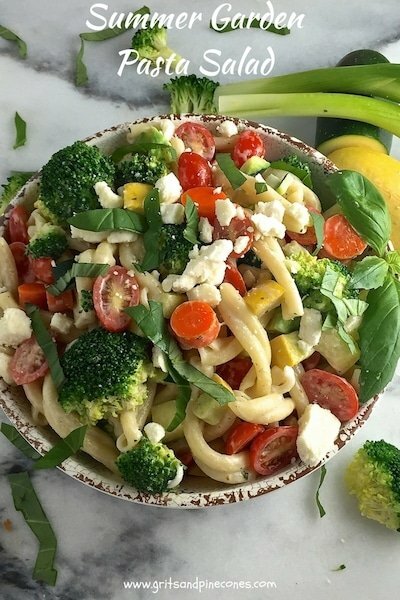 In the meantime, make the Garden Pasta Salad dressing by combining the olive oil, red wine vinegar, lemon juice, mayonnaise, sugar, garlic and pepper in a mason jar or small bowl. Cover and shake the mason jar well, or if using a bowl whisk until everything is thoroughly combined. Add the cooled pasta and veggie mixture to a large bowl along with the tomatoes and scallions and pour about 2/3 of the dressing over the mixture. Mix well. Add the feta cheese and toss carefully to combine. Serve immediately or refrigerate for up to 36 hours. 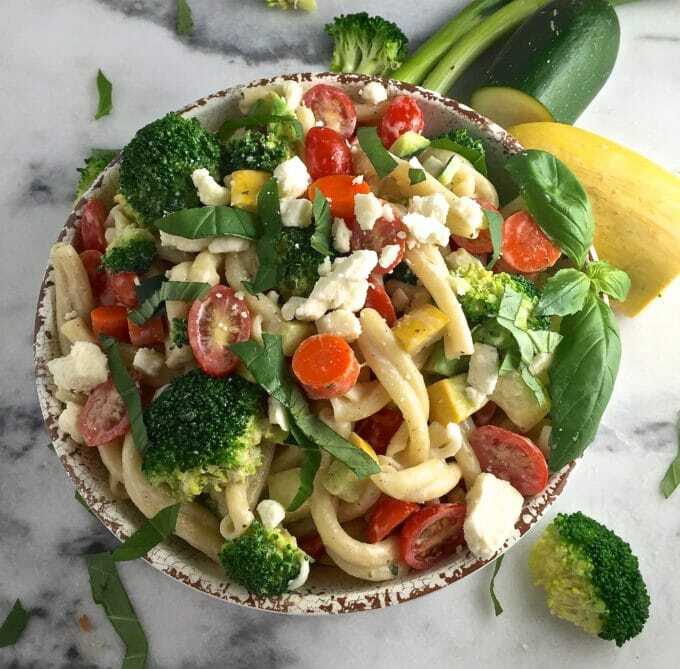 Summer Garden Pasta Salad is a delicious, healthy, veggie-filled salad that is loaded with summer squash, zucchini, carrots, scallions, broccoli, and tomatoes! Add the pasta to a large pot of boiling salted water. Check the directions on the pasta package and set a timer for 3 minutes less than is shown to cook the pasta. For instance, if the directions say to cook for 10 minutes, set your timer for 7 minutes. Thanks Martha! So glad you liked it! Making a run to the grocery store today, getting prepared for the upcoming storm. Will put all ingredients on my list, this looks sooooooooo yummy and I love a good pasta salad. BTW, where did you get that pasta, I’ve never seen it before. Hey Carolyn, thanks so much! I found the pasta at Fresh Market. It pays to look more closely, saw that after I came back to see if you had put it on here. I have never bought their pasta. Thanks. I think I’ll make this the day our storm is to arrive, it looks like it would keep well. Now, Mr Picky Eater won’t eat broccoli????? but he can pick it out, I do think he will like this. Anything with Feta in it and I’m all in.